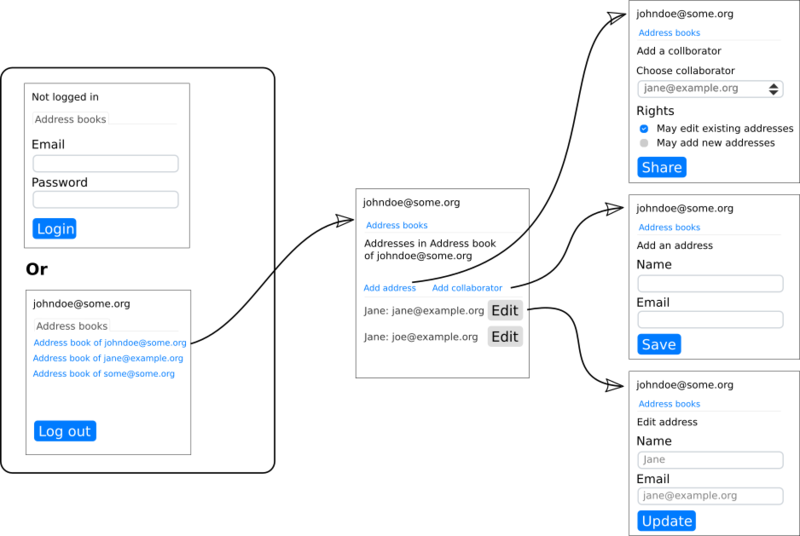 The example in this section is a multi-user address book application. Each user has his or her own address book. Users can also grant other users (called collaborators) the rights to see, change or add to the address books of one another. By default, no-one can see another’s address book. Only the owner of an address book can add others as collaborators to her own address book or change their collaborating rights. If user A adds user B as collaborator (with NO rights), user B can see the address book of A but cannot change anything. If user A gives collaborator B “can modify” rights, B can only edit the existing email addresses in A’s address book, but cannot edit the names those addresses belong to. If user A gives collaborator B “can add” rights, B can add addresses to A’s address book and modify any field of existing addresses. Where addresses are edited or added, you need to make sure that its “email_address” and “name” Fields are editable or grayed out or not shown at all, depending on the rules. The “Edit” button next to each email address must be grayed out unless the user is allowed to edit that Address. The “Add collaborator” and “Add address” menu items must be grayed out if the user is not allowed to perform the specific function on the current address book. If a malicious user figures out what URL to type in order to visit a UrlBoundView for something she is not allowed to visit (ie, someone else’s address book), that page should not be displayed. Pass an Action (which returns a boolean) as a readable or writable keyword argument to the Fields assigned in Address.fields in order to control the access granted by any Input that displays that Field. If a Field is readable, but not writable, an Input using it will be present, but greyed out. If the Field is both readable and writable, the Input will be displayed and active. If the Field is not readable and also not writable, the corresponding Input will not be displayed on the page at all. It is also possible for some Fields to be writable, but yet not readable (as used for passwords—that may be written but not read). In this case, an Input would be displayed and be active, but it will always be rendered without any contents. The name Field is required, but that only applies when it is writable. Specify access control on each UrlBoundView by setting its read_check or write_check to a callable that returns True only if the user is granted the relevant right. An item on a menu (Nav) is a link to another UrlBoundView. It is automatically disabled (or not shown at all) depending on the access of its target UrlBoundView. What if a malicious user discover what the URL is for an addresses she is not allowed to see? Since EditAddressView is already aware of access rights (as per the previous section), visiting that URL will result in an HTTP 403 error if the user does not qualify to see it. Reahl safeguards against many potential ways that malicious attackers could try to bypass your restrictions. A malicious user could edit the HTML in the browser to enable inputs that were originally disabled. However, the same access control rules that generate that HTML is again checked server side when input is received to ensure this cannot happen. A malicious user can also snoop on network traffic to the browser and see sensitive information, such as a password. To guard against this, a Widget can be made “security sensitive”. If any security sensitive Widget is detected on an UrlBoundView, that UrlBoundView is automatically served via HTTPs. Any Widget that has a non-default read_check is deemed security sensitive. Alternatively, call set_as_security_sensitive() explicitly. In the case of Input Widgets, the same inference is made from the access rights of the Field to which it is linked.